The police has arrested everyone else but the man who was caught on camera running away with the mace. 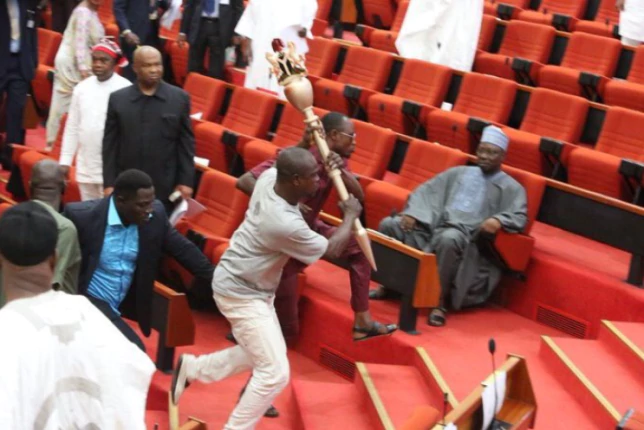 The man who grabbed the mace before storming through the aisle and out the chamber with the senate’s symbol of authority, was wearing an ash coloured T-Shirt on white pants. All the television cameras in the land spotted him. The smartphones captured him bolting. Photographers spotted him dashing like he was auditioning for the Olympics. He was the man who wrestled with national assembly security and escaped from the building with the mace in his vice grip. The mace man hasn’t been arrested by the police, a month after. “Among the suspects that were suspects, the person who took the mace was not among those ones arrested, that means he was part of those that ran away with the mace,” a commissioner of police, Habu Sani, stuttered when he appeared before members of the national assembly ad-hoc committee investigating the mace theft. According to the police, six suspects have been arrested in connection with the mace drama except the guy in an ash coloured T-Shirt. “That’s why I said all these denial wouldn’t have taken place if we have the CCTV camera. Even the person that was recorded to have stolen the mace was not part of those arrested”, CP Sani reiterated to stunned lawmakers. So, what exactly has the police been doing? Why arrest everyone else but the man who grabbed the mace? Of course ash man wasn’t working alone. He certainly had accomplices in high and low places. Do these other six who are in police custody, know ash man? Is he one of them? Is he from Senator Ovie Omo-Agege’s constituency? Is he on the payroll of Omo-Agege? How come the police can’t even put out the name of ash man or splash his face across the dailies as a wanted man? Is ash man an untouchable kinda thug? If cameras caught ash man dashing out with the mace, the police should have no problems arresting him, surely. Why arrest everyone else but ash man? What happened on the floor of the senate in April was a national shame–a desecration of the hallowed chamber of the national assembly. Even more shameful is the fact that the police now seem to be playing politics with it all.